About a week or so ago Trek dealers were sent images and info on a strangely named full suspension device with 29+ wheels. I checked it out and then realized that it probably was under an embargo since there was no chit-chat online about it. I was correct, as Trek did not release the details until yesterday. However; some dealers were getting these bikes in already and I heard about an "unboxing" at Cycle Works in Lincoln via my good friend, MG. MG is in possession of a Stache 9.8 hardtail and we discussed the potential small animal crushing abilities of the Stache and Full Stache bikes. Trek brings a lot to the table when it comes to design and R&D, so I suspect that this bike will be pretty dialed, and the early pieces by the various mag media wonks seem to agree, the Full Stache is a rock crawlers dream. However; and as one report I read rightly points out, this bike is not the only bike of its kind. Salsa has the Deadwood FS, and Lenz Sport has been refining this platform for years. I've followed with great interest the development of the Lenz Behemoth 29+ and Fatillac designs. Traction has been one of this platform's biggest pluses all along, so to read that about the Full Stache is no surprise to me. Interestingly the Behemoth has 435mm chain stays vs the 430mm of the Stache, but the Behemoth has a traditional diamond shaped rear triangle which should be stiffer than the Full Stache and the mag media wonks are already telling us the Full Stache is flexy in certain situations. Also worthy of pointing out, the Behemoth uses a through axle in the rear which is 12mm X 157mm, a DH standard. This gives a wider and more rigid stance for the rear wheel to work in, and with a carbon rimmed wheel, I cannot imagine that the Behemoth wouldn't be a stiffer, more planted bike in the fast twisties. But the Trek does give you a more open front triangle and for those who want to bike pack in the back country, that may be a more appealing feature. I can see that for sure. The thing is that with the Salsa Deadwood, the Behemoth, and now Trek supporting this type of use for full suspension 29+ wheels and tires, the future looks a little more secure for these wheels use in mountain bikes. Added to that you have the Krampus, Stache hard tail, and Jones bikes, plus some various smaller companies doing things in 29+. The future looks bright for these wagon wheels. I was super stoked Thursday when I was sent the rendering for the t-shirt for the volunteers for Trans Iowa v14. The design will be as shown- white logo on black t-shirts, because black is the only color for t-shirts. Ha! Only half kidding there. You should look in my t-shirt drawer sometime. So, a bit of a back story here: Jeff Kerkove went to college and studied graphic design. He did all the headers for Trans Iowa up through T.I. v9. I took over the job for v10 and beyond. 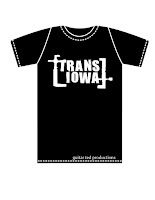 Anyway, Jeff's original Trans Iowa logo appeared on every header from v1 through v6. It has appeared as a sticker (v6 and a couple other times in rider's race bags), and on the blog here when I write about Trans Iowa. It was used once on a t-shirt for Trans Iowa v5. I figured it was high time we brought the design out of mothballs and used it prominently once again. 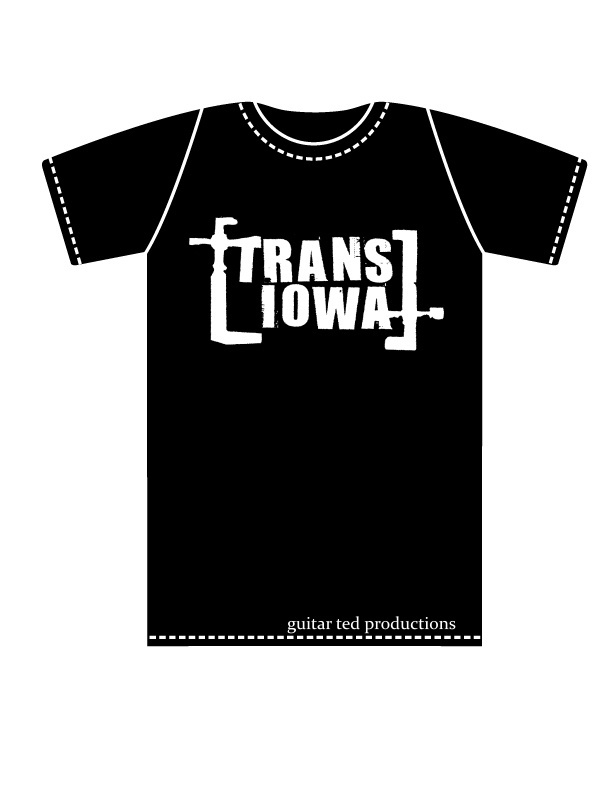 Although it probably will be too cold for t-shirts at Trans Iowa v14, our volunteers will be sporting these shirts, so look for them to appear here and there in the future. When you see someone with one of these on, you will know that they were a T.I.v14 volunteer, or that you found me! I'll have one or two of these in my t-shirt drawer in the future. They should fit right in there! We probably won't be getting passed by farm equipment this year! The ride is tomorrow and I'll be joining my four Renegade Gent's on the Careless Whispers team for the 8th time. It's going to be a blast, because, how could it not be? Due to the forecast low temperatures, which are more February-like than April-like, the start was pushed back an hour by the organizers. Still, it will most likely be in the low 20's when we start and if we are lucky we will see the high 30's later in the day. I'll be riding up to the start from Ankeny, like I did last year, so I'll be out when it is really freaking cold! I doubt we will see any traffic out in the country when the event is on since absolutely zero farming is happening now. Heck, we are still experiencing Winter! I suspect the weather will break soon, I mean, it has to, right? It's just too bad it won't be nice at the Gent;s Race. I guess we will just have to pedal harder to stay warm! Once again, expect a full report of the goings on come Monday. That's all for now folks! Stay warm and get a ride in! Those t-shirts look rad! We will see you on Saturday, I was wondering what team you were on... looks like we are starting almost exactly one hour after you guys. Not sure we are in any hurry out there so I probably won't see you on course but hopefully after at the Nitehawk. Have a great race if I don't see you amongst the crowds. It's still winter here in Eau Claire, WI. 22 degrees and the wind is whipping out of the north. I decided that today was a good day to stay in and read. Trek's on a roll with the cool bikes lately.